In one of my more successful MOOC outings, BonkOpen2012 with Indiana University’s Dr. Curt Bonk, I picked up the idea of the Eight Noun Introduction. I really liked it and proceeded to riff of of it a little, using Wordle to add some visual flair to the idea. This is what resulted. While I love the idea as an introductory activity and use the task with online students, I wanted to riff off of it again, spinning a new version for #ETMOOC. So here is the new #ETMOOC-styled version 3.0 riff on the concept, complete with some motion and sound. It is definitely a little different than some of the Intros I have watched, but I wanted to tinker. Making this video version was a bit of an experiment, really. Consequently, it took longer than I expected to make, as I played around a lot trying different ways of putting things together. Since the original image was the product of the algorithm used by Wordle, I ended up having to kind of deconstruct it. Trying to figure out what font was being used was actually one of the more time-consuming efforts, certainly more time and effor than I expected. For those wondering, it is Coolvetica, which I had to download. Here is how I built the rest DS106-style. I opted to use Keynote on my MacBook. Truthfully, after years of using PowerPoint, I am still getting a bit used to Keynote. I like it but can get frustrated easily at times. However, there are some clever features that I am growing to like more and more, namely the Build Inspector. Considering what I was hoping to create, it seemed like a good opportunity to practice too. To begin, I pasted the Wordle image onto a blank slide to use as a template. Then I recreated the words with an individual Text Box for each one, matching the color by eye as best I could. After rotating and placing all of the individual text boxes in the proper positions, I could delete the original template image, essentially having recreated it as a slide with movable parts. The next challenge involved all of the moves. For speed and sanity sake, I created a separate slide to use as a staging area for each word, crafting each move. To get the final placements exactly right, I did have to map each word’s placement on the original reconstructed slide. One bonus is that all of an object’s moves in the Build Inspector are preserved even when cutting and pasting the object into another slide. So once all the movements were set, I could paste it back on its individual slide, just to keep everything separate and organized. Once each word and set of moves was finished on a separate slide, I created a new blank slide to serve as the foundation for all of the animation. This slide would become the only one needed once built. At that point, it was simply a matter of copying and pasting each word on the new blank slide in the order of appearance. With everything now assembled on a single slide, I tweaked the timing of each word’s movement in the Build Inspector to make everything flow a little better. All that was left in Keynote was the export, which required a small adjustment in the frame rate, because I knew I was going to use iMovie to merge the video and audio together. I probably could have done the whole thing in Keynote, but iMovie offers a little more specific video control than does keynote. It seemed necessary to use some music to score the video so I did a quick search for some royalty free tunes. I wanted something on the jazzy side, then found my way to The Underscore Orkestra’s “Devil with the Devil” track. Using Audacity for speed’s sake, I trimmed the opening 40 seconds of the tune and exported it as an mp3 file. With all that prep work it was quick work in iMovie. Import the video. Import the recut tune into iTunes, so it is easily accessible in iMovie. Then merge the video and audio together. As a timing consideration I did have to split a freeze frame at the opening, so that I had a blank white screen that I could manipulate to delay the opening move and make it work better with the music. There were a few small obstacles along the way that I could foresee that could cause many people trouble. Exporting out of Keynote or importing into iMovie there will always be a frame rate issue that has to be resolved on one end or the other. My advice is to alter the fram rate and export from Keynote at the highest quality. That will guarantee better result when it is imported into iMovie. The aspect ratio needs to be 4:3 with no theme when importing into iMovie. Also, as mentioned, audio needs to be imported into iTunes or GarageBand to be easily accessible in iMovie. The fading can be done iMovie as well but the controls are a simple. A main issue is matching the audio clip length with the video length, which was one of the reasons I dropped it all in iMovie. I find it easier to wrestle with all the timing in iMovie. 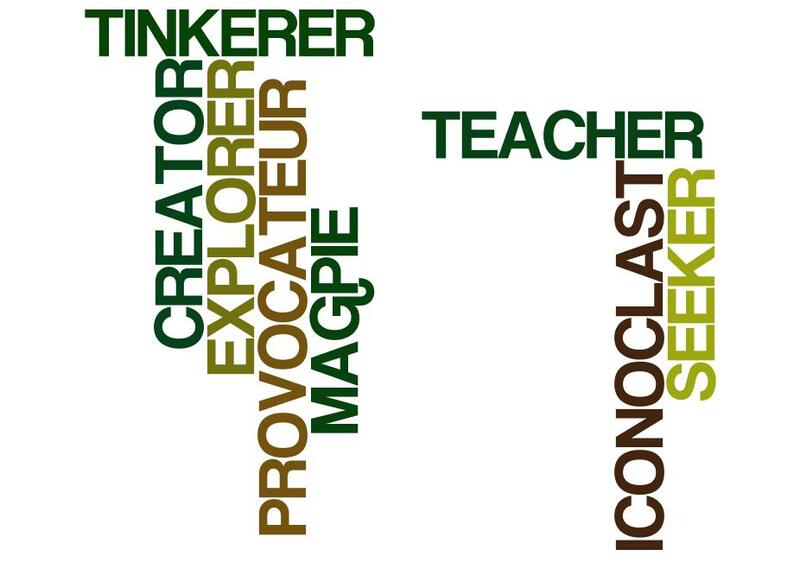 This entry was posted in Teaching & Learning and tagged bonkopen, Coolvetica, Curtis Bonk, Eight Word Introduction, ETMOOC, Video, Wordle on January 18, 2013 by Fred Haas - @akh003. For the last few years I have been contemplating the training of teachers, mentorship programs, and all kinds of preparation and professional development efforts. However, in this second week of the Bonk MOOC, Instructional Ideas and Technology Tools for Online Success, an interesting question about learning styles and teaching was posed which brought a lot of my thinking on early teaching practice to the fore. Here is a slightly modified version of what I added to the course. I think it is pretty fair to claim that our own learning styles greatly impact our teaching whether we realize it or not. That seems fairly obvious. Yet, I think it is a little more interesting and complicated than that alone. In fact, I would submit that it is in part a combination of our own learning styles and the way we were taught while students that are the two most critical factors in any teacher’s practice, at least in the early going or until they become self-aware and take measured steps to move beyond them. I firmly believe that almost all new teachers perform out of a legacy to which all of their previous instructors taught. They mimic what they believe to be the best practices that they experienced as a student, possibly tweaking things based on what they see as improvements. They operate from this legacy in the face of any information to the contrary in their early practice mostly out of survival. Also, many of those methods that are adopted are comfortable and very likely appeal to their own preferred styles of learning, as well. They draw on their experiences and possibly even engage in some fuzzy nostalgia about the “days when I was in school.” Poor teachers remain locked in this Phantom Zone of legacy teaching, until they become self-aware enough to break out of it. A corollary path is what might be considered the legacy rebound. It is still greatly informed by the legacy but more oppositional in nature. The teacher may still teach the way that they were taught subconsciously, but there are those teachers that enter the profession out of a sense of discontent. They react to the way that they were taught, particularly by instructors that they deem less than satisfactory, and think, “Well, Hell, I can do a better job than that.” What’s more, in most of these instances the unsatisfactory instructor was likely not appealing at all to the learner’s desired style, at least not enough to appease the frustration. The obvious solution in any would-be teacher’s mind, if this is at least part of their inspiration, is to teach in a way that favors their learning strength. So they begin their practice with a sense of mission to outperform their own past teachers. Teachers in this group probably are the most impacted by their own learning styles. This can be just as limiting as the Phantom Zone of legacy. Of course, it is not all binary. However, I steadfastly believe that most teachers are kind of stuck on these paths at first, until they have enough experience and master mentors, well after they have been practicing for some time. Then they can become self-aware as teachers, recognizing their strengths and weaknesses with greater clarity, and when they are no teaching for survival. They will have progressed beyond the early phase of their practice and are no longer in a battling in the same way, engaged in a kind of self-absorbed dual consciousness of trying to do the best job they can do while simultaneously monitoring their own performance. Once they have a few go to strategies and success under their belt, they are ready for that next stage of development, honing and elevating their practice to a place of conscious testing and application. It is definitely part of the learning curve for any teacher, and it takes time, patience, and reflective practice. I am not convinced that all teachers get to this point, but the best ones always do. They are not limited by the legacy or their own learning styles. They are free and aware enough to engage with workmanship that is truly responsive and student-centered. They have a well-adjusted understanding of what kind of teacher they are and are capable of valid self-assessment and reflection that guides improvement and professional development choices. One of the troubles with a profession like teaching, where there is such a high turnover rate, particularly in the first five years, is that narrow time frame almost assures that there will be a limited number of teachers that advance to that state of self-awareness. Teachers that leave before five years simply haven’t likely taught enough to graduate to a better practice. Worse still, it doesn’t make any difference how accountable they are or not, because they would be teaching with a kind of handicap and may not even know it. Yet, digging into that fact is probably a topic for another post. This entry was posted in Teaching & Learning and tagged bonkopen, Curtis Bonk, MOOC, teaching on May 8, 2012 by Fred Haas - @akh003. Recently, I have been pretty actively engaged in some coursework about blended and online teaching. While I have been teaching in both arenas for few years now, I am always on the lookout for new wrinkles and developments. Plus, I am just a learning junkie. Were it completely up to me and I didn’t need to chase graduate credits to climb the wage scale for my teaching position, I would almost certainly focus a significant amount of professional development efforts on Massively Open Online Courses (MOOCs). For the past few years I have been following and continuously fascinated by the work that George Siemens, Stephen Downes, and Dave Cormier have been doing. While I have never been able to stay completely focused on one of their MOOCs for the entire run, I have been following along in one way or another since the CCK08. I was quite excited for year’s Change11, yet have been only able to dabble a little here and there, pretty much for the aforementioned credit chase. I am hoping to spend some more time this summer poring over more of the change11 weeks that I was too busy to investigate. Still, timing was ripe and I was well primed to start following Curtis Bonk‘s attempt at a MOOC, called Instructional Ideas and Technology Tools for Online Success. I first discovered Bonk a few years ago during one of my forays with the Flat Classroom Project. Since then I have gotten a lot more familiar with his work. He is one clever and comic professor. So his presence and the topic were instantly interesting. As week 1 wraps, the course has me reflecting on a few things. It has reminded me of just how much I dislike Learning Management Systems (LMSs) in general. Bonk’s course is using Blackboard’s new CourseSites product, which is their new free application. In what is kind of a product debut, this course has already exposed not only its flaws but the flaws of an LMS being used for an experience that includes so many people. Currently this course is at over 3000. These kind of tools are really just built to scale like that. This product is particularly feeble in its ability to handle this kind of load. As in all MOOCs the discussions are enormous and overwhelming. Despite participating pretty strongly, that aspect can be pretty dissatisfying. Clearly others have felt similarly, because the discussion board for week 2, at least check on day 3 only has 30 posts. All of my previous MOOC experience strengthens the notion that some of the best online learning happens across distributed networks. Even for Bonk’s course some of pretty interesting conversation is already happening outside the course itself, here and here. Even Dr. Bonk, himself, jumped into the fray of the Comments sections for both blogs’ rich exchanges. After all, LMSs are a whole lot more about management and whole lot less about learning, to be sure. Even the idea of blogging within an LMS seems to defeat the whole purpose of the activity. Yet somehow the CourseSites folks have served up that possibility. Truth is, threaded discussions might be the only real value added by an LMS and mainly because they simply act as a single repository. Even Siemens, Downes, and Cormier have gradually angled away from linking to an LMS. An LMS is by its very nature closed . Also seemingly closed is the content or resources. As much as I like Bonk and his work, I am a little disappointed that essentially all of the resources for the course are written or produced by him. That belies a little of the openness, despite Bonk’s clear open nature. This makes participating a bit like being an outside observer in one of his Indiana University classes, which is certainly worthwhile to me. However, I can see how that limits the appeal and weakens it claim of MOOCness, if there is such a thing. I am going to stay with it, in part because I am interested in the content. Plus, it weaves nicely with some of the other PD on which I have been working deeply. However, were that not the case, I am not sure I wouldn’t be feeling a little like some others. There definitely seems to be some serious criticism flying around the blogosphere, which I have joined. Still, in spite of any criticisms I am still fascinated and want to continue. This entry was posted in Learning, Teaching & Learning and tagged BlackBoard, bonkopen, CCK08, change11, CourseSites, Curtis Bonk, Dave Cormier, flatclassroomproject, George Siemens, LMS, MOOC, Stephen Downes on May 5, 2012 by Fred Haas - @akh003.